Most people associate the Amish with Hex signs. The truth be told, Hex signs are not representative of either Amish art or Mennonite traditions. In fact, neither communities place the signs on their barns or other property. Actually, Lutherans who came to Pennsylvania at the invitation of William Penn introduced these artistic signs to the area. These early Pennsylvania German settlers placed these images on birth certificates, furniture, textiles, and so forth. Nowadays, you will commonly see these brightly colored signs placed on the sides of barns and homes throughout Lancaster County. They're usually circles with brightly colored geometrical designs inside. Often images of birds, stars, and flowers are painted inside. There is actually a dispute among experts as to the exact derivation of the name. The most common opinion is that the name comes from the word, "hexagram." Scholars who believe that the designs have only a folk art significance point out that the most popular Hex signs consisted of six-sided geometric designs which are commonly called hexagrams. Thus concluding that the name came from the Greek root "hex" which means "six." Over time, many romantic misconceptions grew regarding these signs such as that they derive from religious traditions of the Mennonites and Amish. Hex signs were also mistakenly believed to be satanic or that they play a part of some kind of esoteric mystery with a hidden meaning known only to the privileged few. Sort of the way European art had a secret meaning in The Da Vinci Code. This view that Hex signs have an occult meaning seems to make sense in light of the fact that the word "Hex" means "witch" in German. Furthermore, beginning in the 1930's, the tourist industry saw the advantages of building a mythology behind these signs and began to spread the idea of "Amish Hex signs" that keep evil spirits away and bring good luck. Furthermore, the use of stars, the sun, circles, rosettes, and nature in art is a European folk art tradition going back about a thousand years. These images are seen on everything from birth certificates to tombstones throughout European history. Because of the connections to nature, the celestial, and the circle of life, it is very likely that these images had some kind of religious or superstitious meaning at one time in the past. 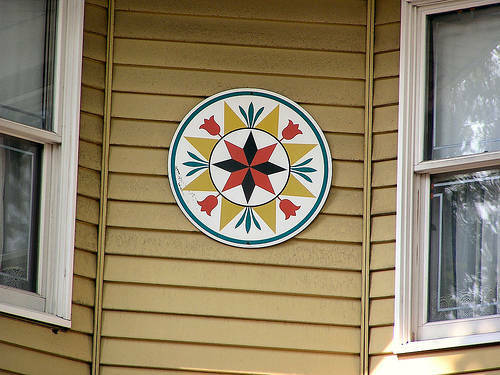 However, most experts today dispute that the modern Hex signs as seen in Pennsylvania Dutch Country have any religious or superstitious significance. The placement of the Hex signs on houses and barns was relatively rare in Europe and is largely a tradition started by the Pennsylvania Dutch. A common recent theory of the meaning of Hex signs is that they were used as a symbol of ethnic pride and identity by the Pennsylvania Dutch. One of the justifications for this theory was that the growth of the public display of the signs corresponded directly with efforts by the state of Pennsylvania to strip the region of its distinctive culture and use of the German language in the later half of the 19th Century and during the beginning of the 20th Century. Ironically, Pennsylvania and the tourist industry have now emphasized the hex sign as a way of embracing Pennsylvania Dutch culture. In fact, to this day, the tourist industry as well as marketers frequently use a hex sign when they want to associate a product as coming from the Lancaster County region. Perhaps that is why the general public associates the Amish with Hex signs. The painting of Hex signs on barns began in the later half of the 19th Century and corresponded with the relatively new practice of painting barns. Due to the high cost of paint, barns were not usually painted prior to the 1830's and 1840's. As the price of paint become affordable, the Pennsylvania Dutch began to decorate their barns. However, it wasn't until a century later during the 1940's that Hex signs were actually made commercially so they could be purchased and mounted on buildings. The general consensus is that the growth of the popularity of the Hex sign within the past 60 years is simply because they are colorful, pretty and make a nice decoration. So, whether or not the meaning of the Hex signs are to keep evil spirits away or to show cultural identity or to serve as decoration, there is no denying that Hex signs are a very popular form of American folk art. In fact, they are one of the most popular souvenirs or gifts that tourist bring back from their Lancaster County visit. Funny enough, while most experts agree that the Hex signs did not originally have a great deal of esoteric, religious or symbolic significance, the popularity of these signs as well as the romance of the mythology has inspired a new genre of Hex signs. Many "hexologists" today purposely create new designs and ascribe their own meanings to them, based on the combinations and symbolism involved. Furthermore, the specific colors may also express a meaning.